The TS9 has great tone to start with. After the modifications, this pedal sounds indescribably better. Every component added is of the highest quality. There are metal film resistors in the circuit to improve the signal to noise ratio. Film capacitors are used in the tone section to provide the smoothest midrange and high frequency. The choice of capacitors for the unique Tone Cap mod increase the low-end tone of your guitar without adding the slightest bit of muddiness or dullness to your tone. The integrated circuit used is the Texas Instruments RC4558P. This chip was chosen because it provides the best sound quality available. This pedal has been modified to have the More/Less Mod. This allows you to have less distortion in the lower settings of the Drive control and more distortion and saturation in the higher setting of the control. All the stock TS9 settings are possible throughout the midrange of the control. Plus, none of the singing sweet midrange tone is gone! -The More/Less mod! 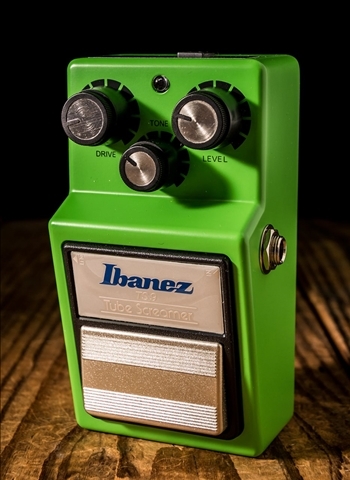 The modded Tube Screamer can get cleaner and more distorted than stock. -All of these mods make the TS-9 Mod Plus the ultimate version of the famous Tube Screamer you can have!